Failing harvests and resulting poverty have led to an epidemic of suicides in India, report researchers. There have been more than 59,000 suicides in India in the past 30 years. Now, experts say failing harvests that push farmers into poverty are likely the key culprits. A new study in the Proceedings of the National Academy of Sciences shows that warming a single day by 1 degree Celsius (1.8 degrees Fahrenheit) during India’s agricultural growing season leads to roughly 65 suicides across the country, whenever that day’s temperature is above 20 degrees Celsius (68 degrees Fahrenheit). Warming a day by 5 degrees Celsius has five times that effect. While high temperatures and low rainfall during the growing season have a substantial effect on annual suicide rates, similar events have no effect on suicide rates during the off-season, when few crops are grown, suggesting that agriculture is the critical link. 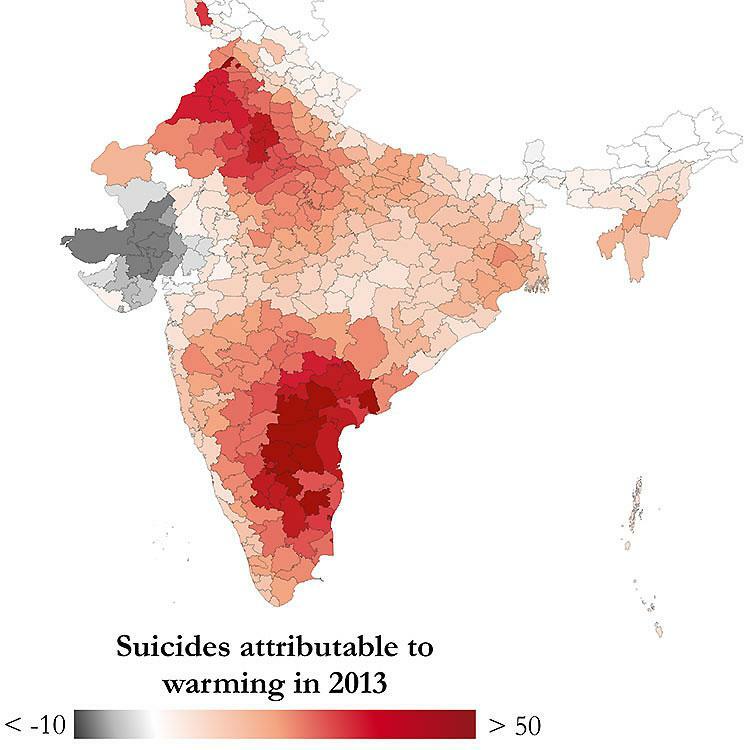 The findings help explain India’s evolving suicide epidemic, where suicide rates have nearly doubled since 1980 and claim more than 130,000 lives each year—and indicate that 7 percent of the upward trend can be attributed to warming that has been linked to human activity. The study demonstrates that warming—forecast to reach 3 degrees Celsius by 2050—is already taking a toll on Indian society. Using methods that she developed in a previous paper published in the journal Science, Carleton projects that today’s suicide rate will only rise as temperatures continue to warm. “Without interventions that help families adapt to a warmer climate, it’s likely we will see a rising number of lives lost to suicide as climate change worsens in India,” she says. Carleton says she hopes her work will help people better understand the human cost of climate change, as well as inform suicide prevention policy in India and other developing countries. The new findings indicate that protecting these workers from major economic shortfalls during these events, through policies like crop insurance or improvements in rural credit markets, may help to rein in a rising suicide rate. Heat drives crop loss, which can cause ripple effects throughout the Indian economy as poor harvests drive up food prices, shrink agricultural jobs, and draw on household savings. During these times, it appears that a staggering number of people, often male heads of household, turn to suicide. Researchers tested the links between climate change, crop yields and suicide by pairing the numbers for India’s reported suicides in each of its 32 states between 1967 and 2013, using a dataset prepared by the Indian National Crime Records Bureau, along with statistics on India’s crop yields, and high-resolution climate data. To isolate the types of climate shocks that damage crops, they focused on temperature and rainfall during June through September, a critical period for crop productivity that is based on the average arrival and departure dates of India’s summer monsoon. The estimates of temperature-linked suicides are probably too low, because deaths in general are underreported in India and because until 2014, national law held that attempted suicide was a criminal offense, further discouraging reporting. The post Climate change in India causes spike in suicides appeared first on Futurity.